Tools of thievery and blasphemous weapons. Strange cursed coins and infernal texts of heretical lore. 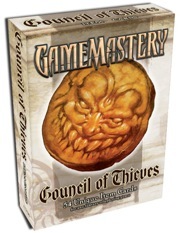 These diabolical treasures and more await discovery in the Council of Thieves Adventure Path. This set of 54 beautifully illustrated full-color item cards allows you to track your newest and most sinister treasures in vibrant detail.